With it's flush button and sleak lines the series 54 system is a beautifully simple design. The countersunk inner button gives a flush inner door and panel which is not only aesthetically pleasing but also aids cleaning. 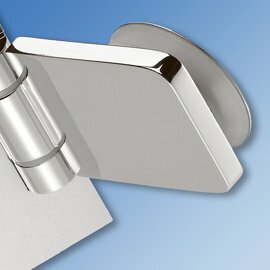 The wall mounting plates of both the hinges and clamps are fixed outside of the shower enclosure and have clip on cover plates. The 54 system hinges are not self centering and require magnetic seals. Glass Thickness: 8mm & 10mm.